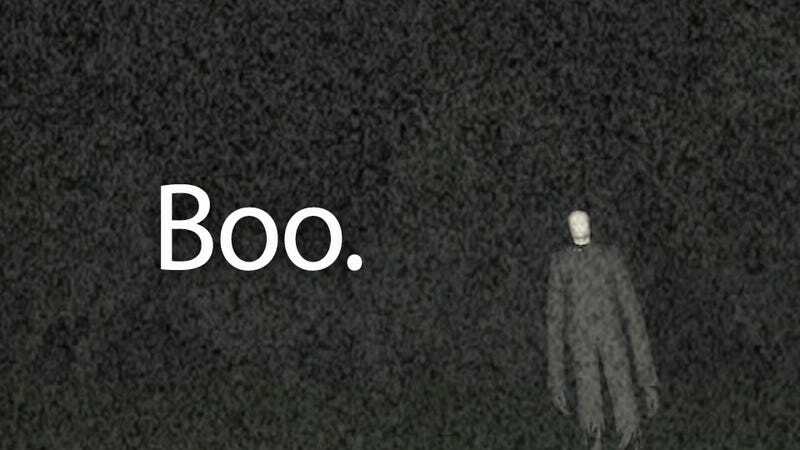 Ever since the breakout success of the stripped-down horror game Slender: The Eight Pages, we've been seeing Slenderman-related stuff cropping up in every corner of the internet. So I wasn't that surprised to fire up the app store today only to see a game called "Slenderman" in the #2 spot of the top 10 paid apps. Unfortunately, the game is a shoddy rip-off of the original, and is in no way affiliated with Parsec's Slender: The Eight Pages. It may only cost a buck, but it's a dollar you could spend on something more worthy. Experience the game they're calling "The most scary game of all time". Slender-Man is a BRAND NEW survival horror game based upon the Slenderman urban legend and "Der Großmann" myth. See how long you can survive before Slender-Man gets you, with only your wits and a flashlight to aid you! This game was so slow it could be a good game of they fix all the errors. Until they fix the errors DON'T PAY FOR THIS GAME! I was so excited for Slenderman to arrive for the iPad, iPhone, or iPod touch but when I started playing it, it was extremely choppy and lagged way too much. I am disappointed. I hope you do make an update soon, then I'd feel less ripped off. This is janky. Many seem to be under the impression that this game is made by Mark Hadley, the man behind the original PC game and the upcoming updated sequel. However, this is not the case—the iOS game is made by someone named Rory Harvey, and it has nothing to do with the original game. Pocket Gamer noticed that when the iPhone version was first released, it was described as being "finally available on iOS." That doubtless misled a lot of people into buying it, thinking they were getting a bona fide mobile version. It's a bit unfortunate to see this kind of thing happening. Mark Hadley and Blue Isle are not involved with this game in any way. We'll take the appropriate actions and follow up with Apple. We have considered doing an Android and iOS version of Slender, and if we want to move forward on that, we'll take our time to do it right. I went ahead and dropped the $.99 to pick up the game, and... well, it needs work. It's got the basic atmosphere right—you walk around in a darkened park, with only a flashlight. But there are no sound effects—just the sound of a beating heart. Your footsteps make no noise, you can't run, and crucially, you're not picking up notes, you're just kind of… walking around. Until eventually the Slenderman turns up and I guess you run? But then you die. And when you die, nothing happens, the screen just gets static-y and you can't move your feet anymore. Slenderman just sort of stands there. All in all underwhelming. Slender: The Eight Pages was stripped down but in an effective way—it had just enough meat to keep you going, and Slendy himself was just scary and odd enough to be truly disconcerting. The iOS ripoff is just plain lazy. But beyond the fact that it's not a very good game, it's also a wholesale reproduction of someone else's idea. At the bottom of the App Store game description is this: "COMING SOON: Objectives, new hiding locations, performance improvements and more!" A number of App store reviewers are, therefore, hopeful that the game will be updated and become less bare-bones and maybe even fun. But I'm hard-pressed to imagine an upgrade that would make this game less of an obvious and uninspired cash-grab. Maybe they'll issue an update that somehow turns it into an entirely different, original game?